We review motion practice in the New Jersey state courts. Motions are generally held on and returnable alternate Fridays called motion days. On some holidays, the date will be changed, generally to a Thursday or the following Friday. The New Jersey Lawyer's Diary contains a list of motion days. Motions must be noticed at least 16 days in advance of the return date, 28 days for summary judgment motions. Opposition papers are due 8 days prior. I certify that the foregoing statements made by me are true. I am aware that if any of the foregoing statements made by me are willfully false, I am subject to punishment. Oral argument must be requested and is then generally provided. New Jersey state court judges handle scheduling in two different ways. One group of judges simply schedules all the cases on the motion calendar, sometimes as many as ten, for 9:00 A.M., and cases are taken as lawyers arrive. Another group schedules hearings for specific times such as 10:30 A.M. Where a specific time is mandated, the lawyer should make sure he is present at that appointed time. About 3/4 of cases are disposed of on the return date, with the judge entering the order that day or setting forth his decision on the record. Many decisions are being written beforehand, and modified only if the argument goes differently than expected. leaving the movant, but one day to file a reply. Courts generally do not exclude late-filed papers. The more frequent course is to request a brief extension from the clerk for reply, or ask that the return date be adjourned two weeks to the next motion day. generally on the Wednesday before the Friday return date. probably more willing to stray from the strict confines of the record than an appellate or federal court. *the foregoing is designed to assist attorneys viewing this page. 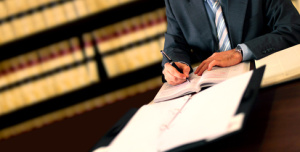 Procedures may vary and this page is not designed to provide legal counsel or advice regarding a specific case or filing and readers are urged to consult with counsel regarding specific questions.